Costa Rica's Caribbean coast feels like a world apart from the rest of the country. The pace is slower, the food is spicier, the tropical heat is more palpable, and the rhythmic lilt of reggae music is filling the air. The Caribbean coast of Costa Rica runs two hundred kilometers between Nicaragua and Panama, and its culture is a mixture of influences, ranging from Indigenous heritage combined with African, Oriental and Spanish bloods, offering in consequence a rich combination of traditions and customs. This development of a culture of its own is also due to the remoteness of the Caribbean coast from Costa Rica's main population centers in the Central Valley. 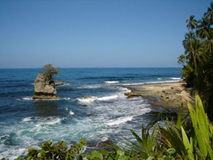 From the city of Limon, capital of the province with the same name, there are good paved coastal roads that lead all the way to Cauhita and Puerto Viejo, which have fantastic beach areas where white as well as black sandy beaches enhance the rustic lifestyle of the Caribbean. The Cahuita National Park protects over 500 acres of coral reef, and its palm-tree-lined beaches are stunning, as well as the remote beach town of Cahuita. An interesting fact about the Caribbean region of Costa Rica is that visitors can easily move from a seashore landscape to forest reserves within a few kilometers and be sure that vegetation and landscape radically change.